When I was young, my parents established a tradition of traveling from Buffalo to Williams College for the Homecoming football game against Amherst College. The games were invariably played on cold and dark November days in the Berkshires. The air was so cold and crisp and startling that I felt as if I were watching not only an epic Division III football game but also the last gasps of autumn before winter established complete control over New England. It was clear on those afternoons that the game would be the final athletic contest of the season. You could sense the change in the air as the hands of an old fashioned scoreboard moved towards the final moments of the fourth quarter. When I played soccer at Williams, my team pointed every year to Little Three competition against Wesleyan and Amherst. We were especially aware of Amherst throughout the season, and whether we were enjoying a strong or disappointing year, we knew that the Amherst game would be the one we would remember. I was surprised and impressed as a freshman to see that before a Little Three game our players and coaches followed a simple ritual—we shook hands solemnly and wished one another luck as the kick off time grew near. As we prepared for these games, we would practice late into the November afternoons, the mountains surrounding Cole Field turning blue and then purple, the glare of the lights from the football field piercing the darkness, and the daylight slowly dying and disappearing. One night my senior year, one of our captains, Chic Johnson, led us on a long run through the darkness of Cole Field. We were ready to run and play forever. 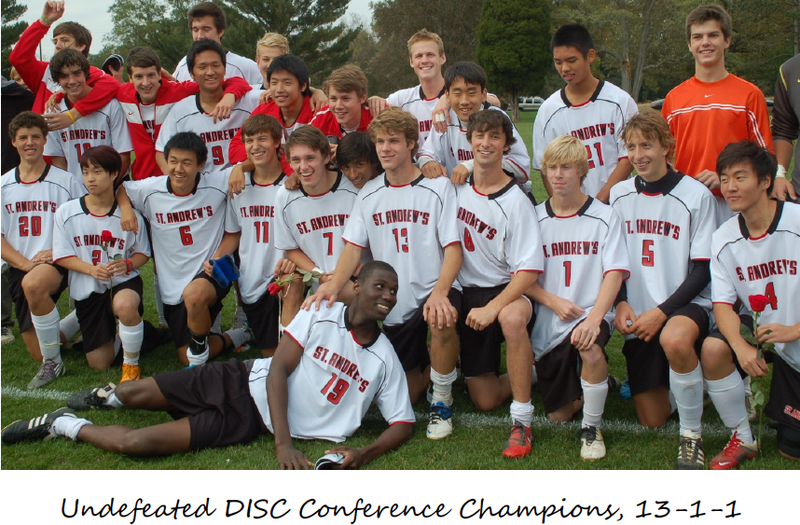 As a soccer coach at St. Andrew’s, I identified November and the end of the season with flocks of geese flying over our field, soft autumn light spreading itself over our magnificent Wembley Field and shouts of anticipation at the prospect of playing under the lights in the Delaware State Tournament. We yearned and chanted for lights, for life and survival in the soccer tournament once dominated by soccer powers, Concord and Brandywine. We loved everything about the experience of the tournament: the practices that ended in darkness, the splendid isolation of being the last team standing at the end of a season, the evening practices lit by the Volkswagen Rabbits Will Speers and I parked behind the goal, the early dinners preceding the game, the uniforms hanging in the dusty forlorn locker room in the Old Gym, the walk out into the cold air to greet the bus, the ride up or down Route 13 to either Wilmington or Dover, the first sight of the stadium lights in the distance. In my experience as a coach, we lost very competitive first round games, advanced to an intense and splendid final in the fall of 1984 and won the whole tournament in 1981. Tied 0-0 going into overtime that cold November night at Baynard Stadium, St. Andrew’s erupted for three goals as the entire school roared in joy and excitement. What remains after all these years is the spirit, energy and vitality of those games, those teams, those individual players. As the great team of 2011 plays under the lights tonight, I will celebrate these players, their coaches Jory Kahan and Jay Hutchinson and the legacy of those special November days.